Climb on board with Great Scenic Railway Journeys as we explore one of America’s favorite and oldest railways. With continuous rail operation spanning three centuries, you can almost hear the voices of the men who labored to build the line through the winter of 1881-1882 while you ride aboard vintage cars pulled by an authentic steam-powered locomotive indigenous to the line. The train travels through some of the most pristine and impressive landscapes in Southwest Colorado. Nominated for three Emmy's, This Public Television documentary will trace this line’s history from its conception to its near abandonment to being one of the most treasured tourist railroads in the world. We will also introduce you to the men and women that help keep this historic equipment running the rails today. 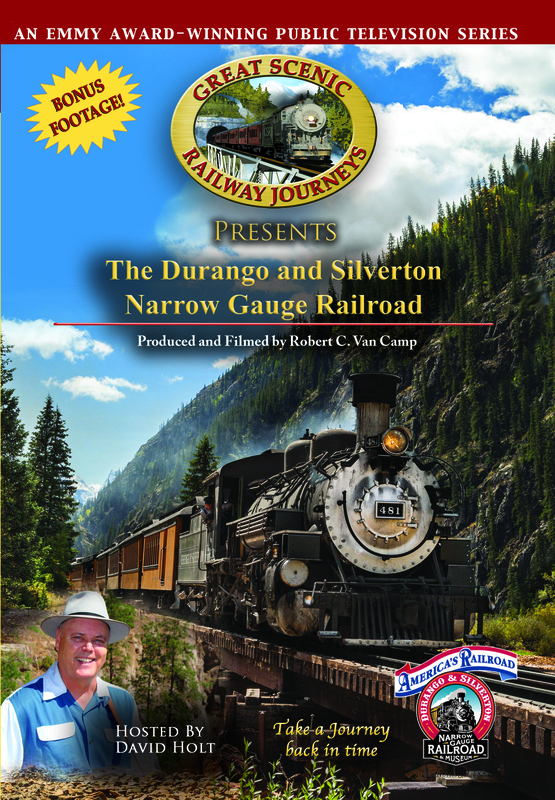 We will tour Durango and Silverton’s train museum, Housed in 8 stalls of the 17-stall roundhouse. the 12,000-square-foot museum is filled with thousands of authentic train artifacts, along with locomotives and rolling stock. As a bonus we have added the original, “Tracks Through Time” video that was hosted by Dennis Weaver.